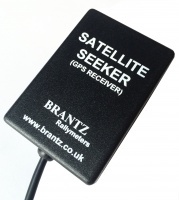 The Brantz Satellite Seeker in distance sensor requiring no mechanical fitting and no calibration. Simply connect up and place by your windscreen. This unit simultaneously tracks many different satellites such as the Russian (Glonass), Chinese (BeiDOU) and American (GPS) systems, giving connection in the most testing environments.